It has almost become commonplace to report at this point, but March was another record warm month. For those keeping track, March was the fifth record warm month in the last nine months. Despite our recent familiarity with such occurrences, it is nonetheless an historic streak. 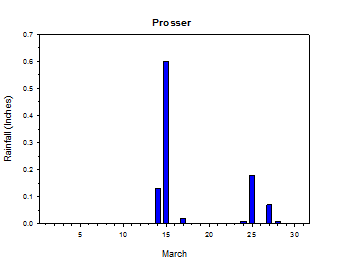 Temperatures at Prosser were nearly five degrees warmer than normal, including more than 6 degrees above normal during the day. March 27th was a particularly abnormal day where several stations in south central Washington set new all-time March high temperature records. Wapato reached an impressive 80 degrees, while Pullman topped out at 72 degrees. 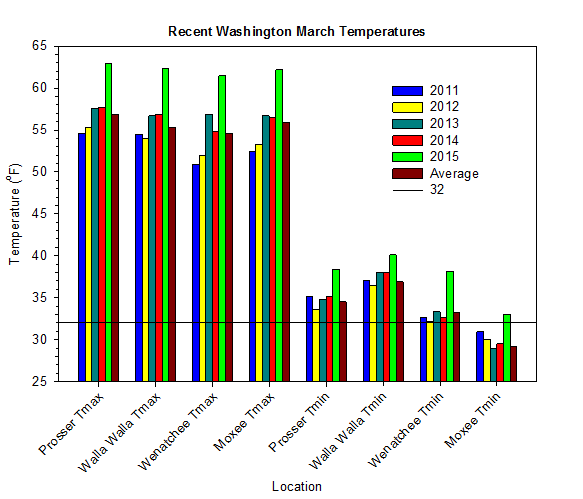 In fact, the final 20 days of the month were largely frost-free across Washington. Following a relatively cool and dry beginning, March trended somewhat wetter and much warmer for the remainder of the month. The cause of the anomalous weather since at least December has been the remarkably persistent large scale atmospheric circulation pattern. The background state has featured a warm, semi-permanent ridge near Washington which is proving to be as tough to eliminate as the thing from another world. March began with dry and cool conditions. Highs were only in the 40s and 50s, while lows were as cold as 20 degrees. However, temperatures by the 10th had warmed into the 60s and 70s in the day, and 30s and 40s at night. The 15th was a wet day across Washington, with 0.6 inches of rain falling at Prosser, and nearly 1.8 inches occurring at Long Beach. Conditions were generally mild around mid month, with highs in the 60s and lows above freezing. Rain fell at times during a rather active late March time period. Temperatures were warm, especially on the 27th, when numerous monthly record highs were observed. Wapato reached 80 degrees, while most of south central Washington climbed well into the 70s. 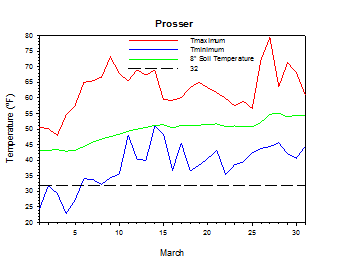 The average March temperature at Prosser (WSU IAREC) was 50.5°F, which is 4.9 degrees (2.2 standard deviations) above average. The average high temperature was 62.9°F, which is 6.1 degrees (2.0 standard deviations) above average. The average low temperature was 38.4°F, which is 3.9 degrees (2.2 standard deviations) above average. 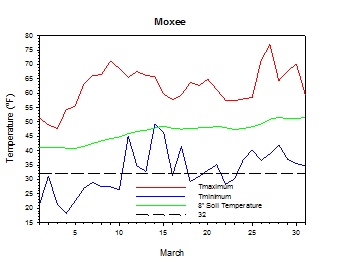 The maximum temperature recorded last month was 79.4°F on March 27th, while the coolest daily high was 48.0°F on March 3rd. 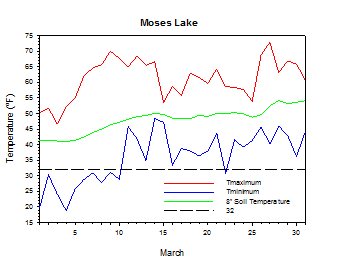 Low temperatures ranged from 50.9°F on March 14th to 22.9°F on March 4th. Daily average temperatures ranged from 61.0°F on the 27th to 38.0°F on the 4th. The monthly precipitation total was 1.02 inches. 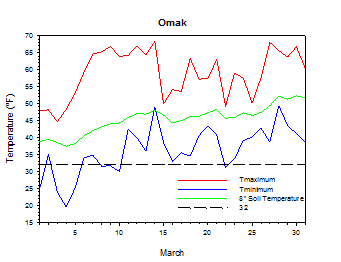 The average wind speed was 4.7 mph, and the average 8 inch soil temperature was 49.6°F. Mt. 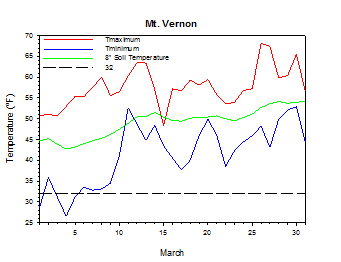 Vernon recorded an average temperature of 49.3°F, which is 4.2 degrees above average. 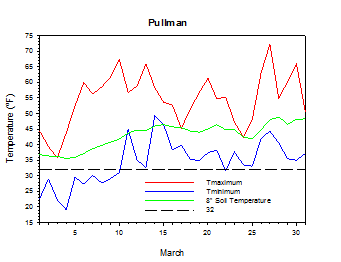 March 4th: The temperature at Pullman plunged to 19 degrees. March 11th: The low temperature at Mt. Vernon was a balmy 53 degrees. 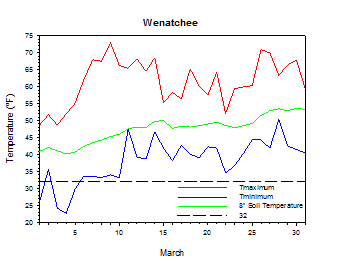 March 15th: 0.5 inches of rain fell at Wenatchee. 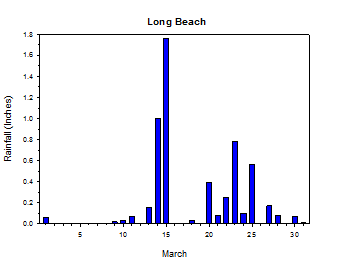 March 15th: 1.76 inches of rain fell at Long Beach. 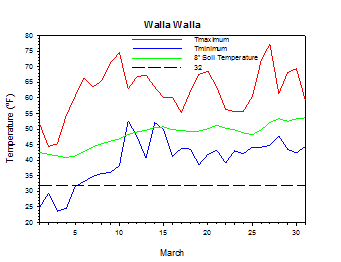 March 27th: The temperature at Wapato climbed to 80 degrees. The growing season quickly bloomed to life during March. Most crops were 2 to 3 weeks ahead of schedule. 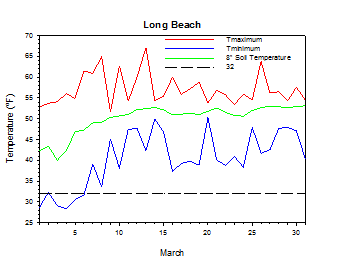 Despite some cool mornings early in the month, most of March was unusually mild. In fact, cherries and some apples were at bloom as of the end of the month. 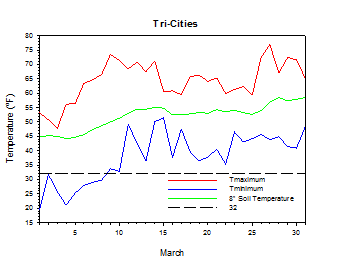 On March 30th, 2003, the temperature at the Tri-Cities soared to 79 degrees. According to the Climate Prediction Center, above average temperatures are likely into 2016, along with below average precipitation through late 2015. El Niño conditions will likely persist and perhaps strengthen in the coming months.